It stands as one of the most ambitious film projects ever undertaken – the screen adaptation of J. R. R. Tolkien’s The Lord of the Rings. 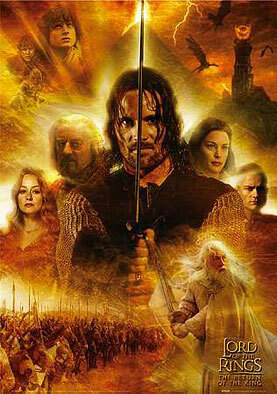 Brought to us over three tantalizing years, the films (The Fellowship of the Ring, The Two Towers and The Return of the King) heralded in the twenty-first century with amazing computer generated imagery tempered by performances on a touchingly human scale, especially from Elijah Wood as Frodo, the young Hobbit entrusted with the mission of destroying the evil ring. Peter Jackson, the New Zealand director of the Oscar winning trilogy, was in Sydney recently in conjunction with an exhibition of TLOTR artefacts at the Powerhouse Museum and he gave a special talk about fate and destiny in relation to the making of his epic masterpiece. He explained how he obtained the rights to the classic 1,200 page book in 1995 through a notorious Hollywood producer named Harvey Weinstein. Initially he envisaged making two films but Weinstein whittled away at the budget until all that could be afforded was one watered down excuse that would have offended every one of the legion of fans of the original novel. Finally Weinstein offered Jackson two weeks in which to find an alternative studio to fund the project, after which he would proceed with his single film version using another director and screenwriter. The project was, in Jackson’s words, 95% dead but in a frantic yet committed flurry he and his team at Weta Workshop made a documentary about their vision for the films then Jackson and his partner Fran Walsh flew to Los Angeles to meet with the prospective financers. But instead of being inundated with offers, all they could muster up were two measly meetings, the first of which proved negative. With their one remaining hope, they played a dangerous game of rescheduling to conjure up the impression that they had a white hot property on their hands. On their very last day in town they made the pitch to New Line Cinema and screened the mini doco. Afterwards the studio head turned to them and said he was definitely interested but shouldn’t it really be three films? And so, by the hair on their chinny chin chins, they were able to give the legend its proper treatment, complete with monumental battle scenes between 600,000 hideous orcs and leaders among men like Aragorn (the swarthy Viggo Mortensen) and the wonderful wizard Gandalf (a marvellous Ian McKellen). It’s an inspiring tale, both the success of the trilogy itself and the behind-the-scenes gumption that made it all possible.